Nobody is a foreigner in Madrid. The capital has always known how to be nice and amiable. Its environment, its bustle and happiness to be alive are contagious. Anybody who arrives in Madrid and remains in the city for some time finds it difficult to leave. ts forcefulness and personality turn Madrid into an unforgettable city, and its plentiful resources of interest to tourism - nature, art, history - are rounded off extraordinarily well by a series of cities in its surroundings which are full of sights of historic interest, some of which have been included by the UNESCO in the list of places considered "world heritage": Ávila, Segovia, Toledo, as well as the Monastery of El Escorial. All of them lie within about 100 km. from the square La Puerta del Sol. The capital has already more than three million inhabitants, while its municipal district covers 607 km2. Next to old buildings of historic interest, there are other modern ones, of doubtless value as well. It consists of different centers that are clearly separated from each other and have a personality of their own. Still others have some peculiar characteristics: there is a MADRID OF THE AUSTRIANS, another OF THE BOURBON; there is also a MADRID OF GOYA, the one of THE MUSEUM OF EL PRADO. THE ROMANTIC, ISABELLINE MADRID. There is the PICTURESQUE MADRID of "El Rastro" (The Flea Market), of the bullfighters, of the flamenco dancers, of the antique dealers, of the artists, of the playhouses. The expression "los madriles" is more than justified since it refers to all the different aspects of the city, among them, MODERN MADRID, with its skyscrapers and avant-garde buildings and squares. 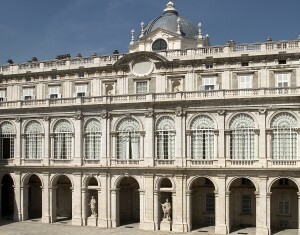 The Congress and Exhibition Hall and the numerous facilities for holding fairs make Madrid a CONGRESS CITY.